Abang Johari addressing the crowd at the rally. 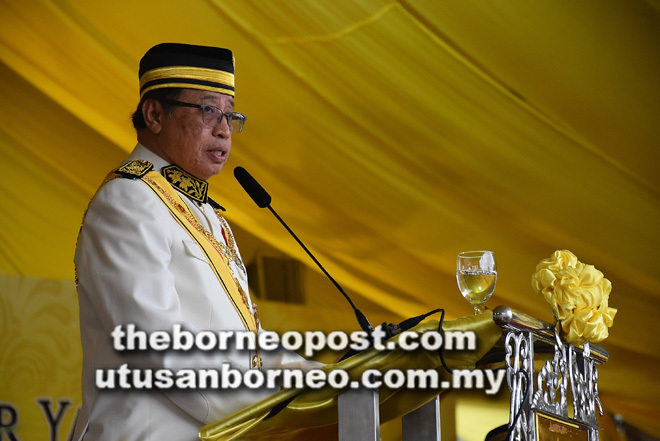 SIBU: Chief Minister Datuk Patinggi Abang Johari Tun Openg has reiterated that Sarawak will not compromise on regulatory rights over its oil and gas activities. Abang Johari said Sarawak also wanted all its rights under the Malaysia Agreement 1963 (MA1963) and Federal Constitution to be fully returned to the state. “Just like Sabah, we are ready to hold discussions with the federal government to find an immediate solution to restore the complete rights of Sarawak as signed by our leaders in 1963, no more no less. We will not agree to anything less,” he said. Meanwhile, he said Sarawak’s economic growth rate was 4.7 per cent in 2017 following the strengthening of the global economy. The total trade recorded an increase to RM137.6 billion as exports grew strongly together with the economic improvements in several other countries. “Our GDP per capita rose to RM49,327 or US$12,000 at current value,” he added. According to Abang Johari, this year, Sarawak’s economy is expected to continue to record a growth of 4.0 to 4.5 per cent. The high commodity prices are expected to support export growth. However, he said, the trade war between China and the US will have an effect on Sarawak’s trade but the state government is hoping for the best. According to him, Sarawak could not rely heavily on the oil and gas sector or on agricultural commodities to boost economic growth as they are influenced by various fluctuations in the global market, but (need) to add more value to the products and create more downstream activities to support higher economic growth.